When a mixed martial arts (MMA) gym moves in across the street from his office, Jonathan Gottschall sees a challenge, and an opportunity. Pushing forty, out of shape, and disenchanted with his job as an adjunct English professor, part of him yearns to cross the street and join up. The other part is terrified. Gottschall eventually works up his nerve, and starts training for a real cage fight. He's fighting not only as a personal test but also to answer questions that have intrigued him for years: Why do men fight? And why do so many seemingly decent people like to watch? 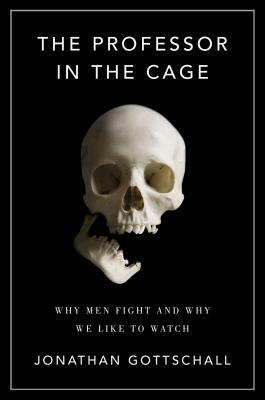 In The Professor in the Cage, Gottschall's unlikely journey from the college classroom to the fighting cage drives an important new investigation into the science and history of violence. Mixed martial arts is a full-contact hybrid sport in which fighters punch, choke, and kick each other into submission. MMA requires intense strength, endurance, and skill; the fights are bloody, brutal, and dangerous. Yet throughout the last decade, cage fighting has evolved from a small-time fringe spectacle banned in many states to the fastest-growing spectator sport in America. But the surging popularity of MMA, far from being new, is just one more example of our species insatiable interest not just in violence but in the rituals that keep violence contained. From duels to football to the roughhousing of children, humans are masters of what Gottschall calls the monkey dance: a dizzying variety of rule-bound contests that establish hierarchies while minimizing risk and social disorder. In short, Gottschall entered the cage to learn about the violence in men, but learned instead how men keep violence in check. Gottschall endures extremes of pain, occasional humiliation, and the incredulity of his wife to take us into the heart of fighting culture culminating, after almost two years of grueling training, in his own cage fight. Gottschall's unsparing personal journey crystallizes in his epiphany, and ours, that taming male violence through ritualized combat has been a hidden key to the success of the human race. Without the restraining codes of the monkey dance, the world would be a much more chaotic and dangerous place. Jonathan Gottschall is a Distinguished Research Fellow in the English Department at Washington & Jefferson College. His research has been covered in The New York Times Magazine, The New York Times, Scientific American, The New Yorker, The Atlantic, The Chronicle of Higher Education, and on NPR. His blog, The Storytelling Animal, is featured at Psychology Today. His book, The Storytelling Animal, was a New York Times Editor s Choice Selection and a finalist for the Los Angeles Times Book Prize."